This Saturday, May 8th, you can help those in Central Florida who are going hungry. How? Simply go into your pantry, pull out at least one canned food item* (nonperishable), and leave it where your mail is regularly picked up. 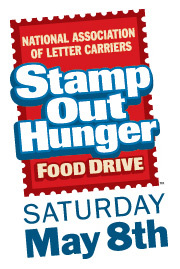 Letter carriers will collect the food and deliver the donations to Second Harvest Food Bank of Central Florida. To find out more about Stamp Out Hunger, and even sign-up to receive an e-mail reminder about donating (c’mon, how easy is that?) visit the Food Bank’s website. Hopefully the good folks of Central Florida will pull together for this, and make this the most successful Stamp Out Hunger yet! *The Food Bank is requesting that donations not include items that have expired or those in glass containers.